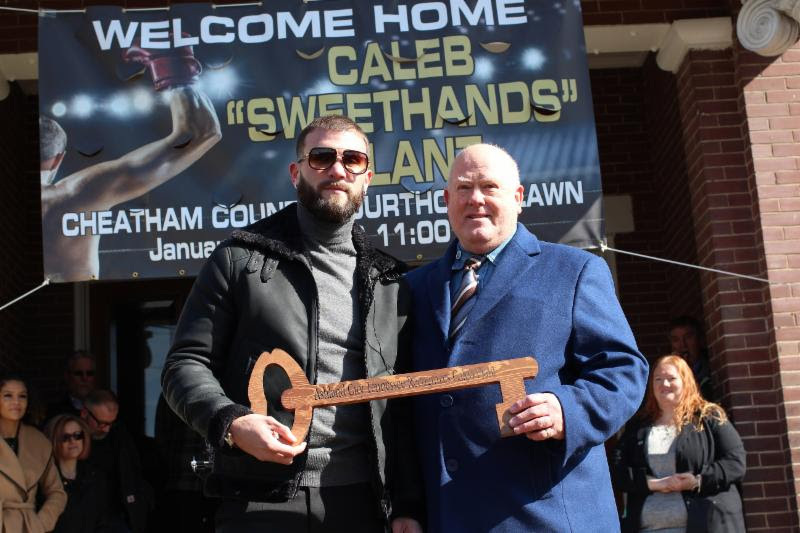 Hometown star and newly crowned IBF Super Middleweight Champion, Caleb “Sweethands” Plant, received a hero’s welcome back in his hometown of Ashland City, TN on Thursday. Caleb received the “Key to the City”, and multiple proclamations from Mayor of Cheatham County Kerry McCarver, Mayor of Ashland City Steve Allen, and State Senator Kerry Roberts and State Representative Mary Littleton of the Tennessee General Assembly. At the event, January 31, 2019 was officially named “Caleb ‘Sweethands’ Plant Day”. In addition, Caleb’s dad, Richie Plant, also received a proclamation for his hard work, sacrifices, and dedication to bringing boxing to the community of Ashland City.